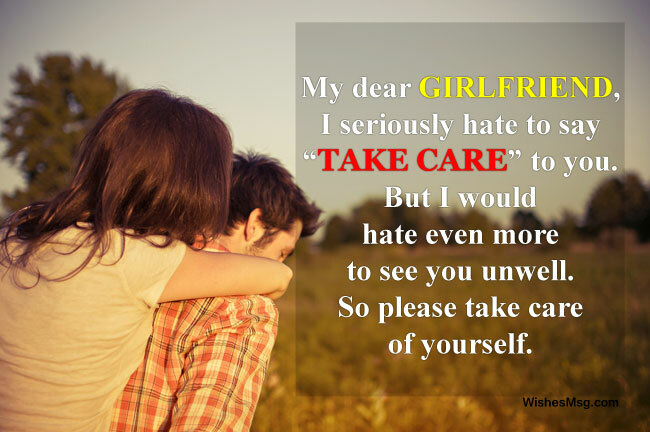 Take Care Messages for Girlfriend : Take care may be a simple phrase that every one of us uses every now and then. But sometimes it can mean a lot more than we think. Especially when we are messaging our dearest ones like a girlfriend, soul mate or even close friends, the way we say to take care of them can reflect how much we love and care for them. To show our care and love for our loved ones, we can always make up some wonderful take care messages to make them feel how special they are to us. 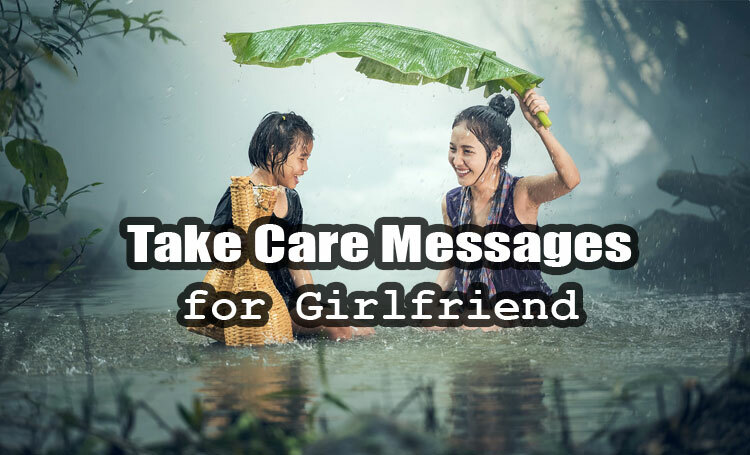 Here are some amazing take care messages for girlfriend categorized into sweet, funny, romantic, inspirational and cute sections. So you can select the most appropriate ones for your lovely girlfriend. Take care of yourself also and encourage others to do the same because peace in mind depends on the well being of the body. You are the most precious thing in my life. I pray to god that he keeps you safe always. Stay happy always and Take care sweetie. My love for you is infinite and all I wish for you is take good care of your health. Because I want to see you always fit and kicking. You are more special to me than you can ever imagine. I pray to god that your every day becomes a day to remember. Take care. Be always in good health by taking good care of yourself. As I love to see you in a healthy and sound mood but the figure and shape of you also matter a few! Take care, my love. Happiness is when I see your sweet smiles. I miss you from here. Sending you lots of love. Take care! Never forget to take care of yourself just like I never forget to remind you about it. Stay well, stay healthy and again, take care of yourself. No matter where I am and what I do, your health is the number one priority for me. So, no matter what the situation is, you need to take good care of yourself. My dear girlfriend, I seriously hate to say “Take Care” to you. But I would hate even more to see you unwell. So take care of yourself please. You need to take good care of yourself because it is getting hard for me to find another girl like you. Just kidding Baby. But, you need to eat well, sleep well, and gain some weight. Take care of your health before the doctors do it for you. I am sure you don’t want to visit a hospital at this age. The truth is, my grandfather has more stamina than you. And he has only one advice for you, – take care of your health. I know you are naturally beautiful. Do take care of yourself unless you want to prove me it was all makeup. Just kidding! But seriously! Take care of your health. I have noticed that you are beautiful. But your internal specification says that you are lazy. Now that I know, I want you to upgrade your system to automatic take-care. I love you! When you have sound health, inspiration comes from within. Take care of yourself daily because personal wellbeing is the biggest motivator. Always live your life to the fullest. Enjoy the good moments but always keep in mind that your health comes first. Take care! There is no alternative to a good health if you want to start your days with a fresh mood. So, no matter how busy you are, find time to take care of your body. Everything will seem beautiful when you have a beautiful mind. 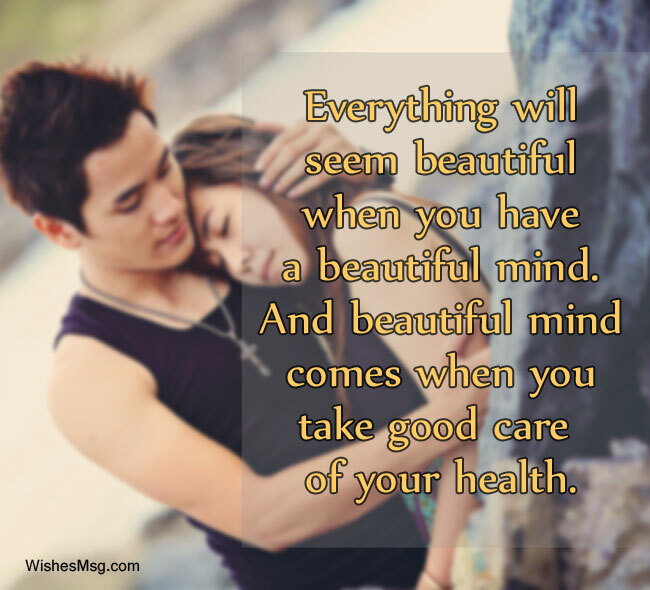 And beautiful mind comes when you take good care of your health. Make every second count in your life. Work hard for your dreams. Stay well and stay strong. Take care. Before you do anything always remember that safety comes first. So, make sure you are safe and sound. Take care! I wish God blesses your days with infinite joy and make your life full of happiness. May you enjoy a sound health for the rest of your life! Take care dear. I’m sending a message to the cutest person alive and I want you to know that I’m thinking of you 24/7. Always take good care of yourself dear. God knows how much I love to take care of my cutie bird. But since I’m away now, will you please do it for me? Please… to make me happy always take care of yourself, cutie! No one worries more than me for you. I hope my cutie pie is fine. Enjoy your time but never forget to take care of yourself. Hi! I am miles away from you and asking for a favor. Take care of yourself! Will you? Keep smiling. I love you. Take care of your health today and have a better tomorrow. I am sending sweetest kisses, lots of love and good wishes. Stay well sweetheart! My love for you cannot be measured in words. I want to wake up every morning knowing that you are well and taking good care of yourself. Doesn’t matter how hard life gets, never forget to find some time to take care of yourself. Because, after all, your health is what matters the most to me. I love you! You are everything that starts my day and everything that I think of when I go to bed. Your wellbeing is what matters the most. Take care. My happiness is proportional to your good health. So, don’t forget to take care of yourself. I know you don’t want me to be unhappy. Send me back a smile of yours when you see this message. I’m waiting to see your happy face. I love. Take care! I can always come up with thousand romantic words to tell you to take care. You don’t know how much I want to see you happy and healthy always. A simple take care message can really show your emotions to your dearest one. So, never hesitate to send a take care message every now and then to the person you love.